I first saw the Dufour Grand Large 500 on paper, not on the water, when Eric Macklin of Dufour Yachts let me have a sneak peek at the French builder’s new flagship. A year later, there she was, afloat at the Annapolis boat show, packed with innovations that seemed to break the mold of traditional thinking in yacht design. I first saw the Dufour Grand Large 500 on paper, not on the water, when Eric Macklin of Dufour Yachts let me have a sneak peek at the French builder’s new flagship. A year later, there she was, afloat at the Annapolis boat show, packed with innovations that seemed to break the mold of traditional thinking in yacht design. I could hardly wait to take her sailing. Below the waterline, the boat carries one of two L-shaped keels, with drafts of 6ft 4in or 7ft 6in, both fairly deep. The hull is hand-laminated with a vacuum-bonded foam core set in polyester resin. The floor is laminated into the hull in such a way that this boat is approximately 2,000lb lighter than its predecessor. The semi-elliptical rudder is filled with closed-cell foam wrapped around a stainless steel stock. 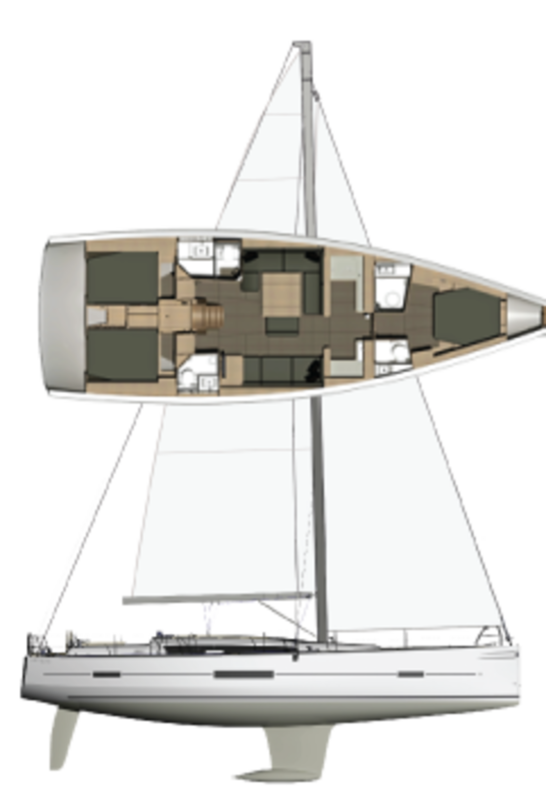 The 9/10ths fractional rig is supported by double sweptback spreaders and spreads a total of 1,084ft2 of Elvstrom sails between the 128 percent genoa and a traditional mainsail. 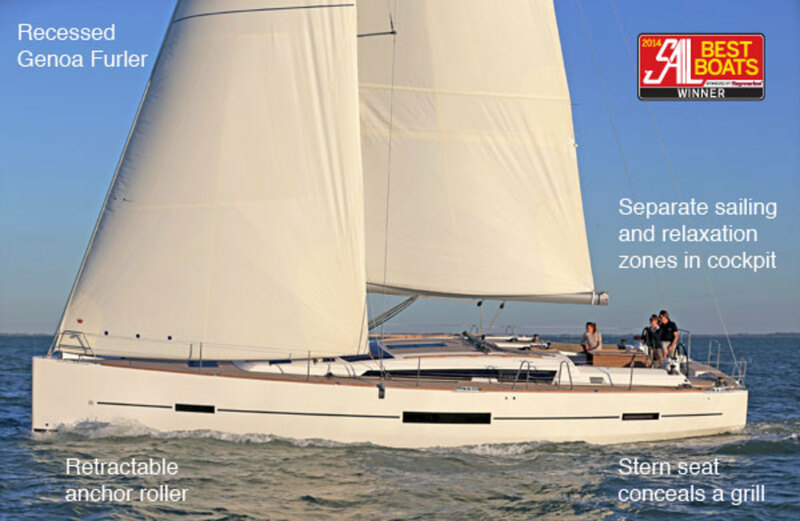 The Z-Spars mast is deck-stepped (a tall rig is also available) and is set fairly far forward to provide room for a large main that drops into an integrated sail bag. With full battens, small tweaks in sail shape will eke out the last little bit of speed. An optional asymmetrical spinnaker can be flown from a retractable carbon sprit, and the headsail is on a Facnor belowdeck furler. Forward there is a recessed anchor locker housing a Quick windlass and a pivoting anchor roller that supports a large Delta anchor. This keeps the hook out of sight (and away from the gennaker) until it’s time to deploy—which is done by lifting it out and over the stem. The target buyers for this boat are experienced sailors looking for a good turn of speed and respectable performance in club racing, so keeping the bow neat and tidy is a bonus. The other end of the boat is equally interesting, thanks to the way Dufour has divided the cockpit into “maneuvering” and “comfort” zones. The forward section of the cockpit is dedicated to relaxation and includes two settees, one of which can be converted into a wide sun-pad or even a nifty sea berth. The drop-leaf table separating the settees has a 12V light attachment, a sink and tap with hot and cold fresh water, and an optional reefer. Hidden in the cockpit sole just aft of the hinged companionway doors are a number of clever halyard bins, so the entryway stays clutter-free, even when sailing. Farther aft, the working part of the cockpit features twin helm stations, each with a multifunction display, and each within reach of the Lewmar primary and spinnaker winches. Beyond that there is a neat central “tower” near the transom that serves multiple purposes, thanks to some creative and clever engineering. 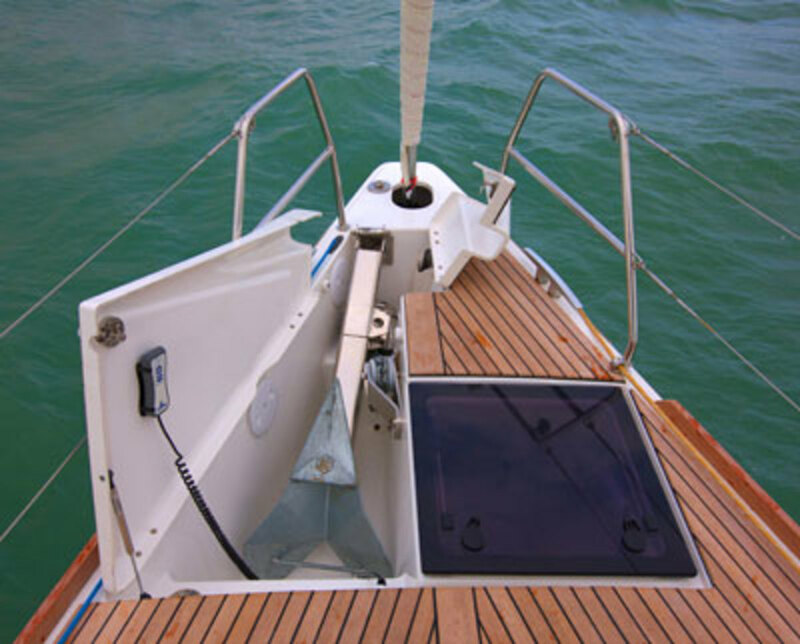 First and foremost, it serves as an aft seat to help a guest or tactician stay clear of the helmsman. It also houses speakers and a freshwater shower, and lifts up to provide access to a machinery space below, which includes the generator and air conditioning/heating unit. Finally, lifting the lid reveals an optional grill, with the now upside-down top of the tower serving as a great working/serving table. Standing on the swimstep, you can cook to your heart’s delight without worrying about heating up the inside of the boat or cramping anyone’s style in the cockpit. he interior is as well executed as the exterior, both in terms of finish and practicality. The basic floor plan offers a choice of three or four cabins and two or three ensuite heads. I expect most hulls will be fitted with the master cabin forward, with its split head to starboard and shower compartment to port. 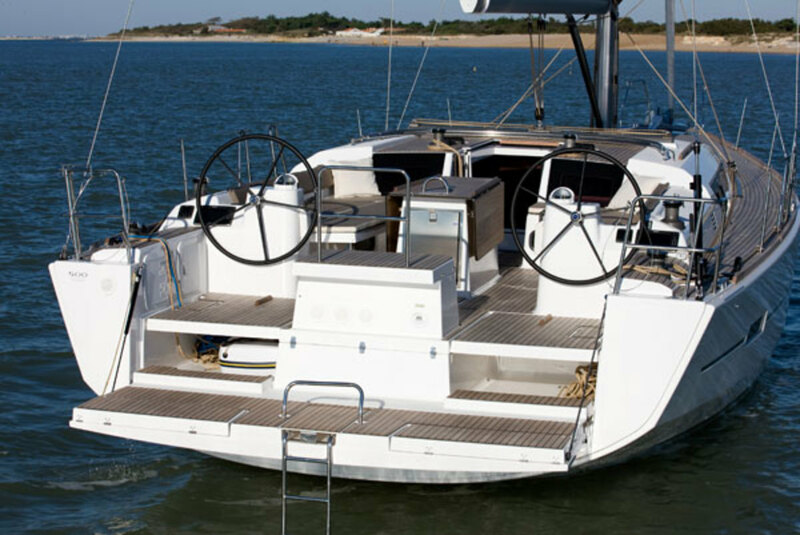 The island berth has drawer storage below and numerous hatches overhead for ventilation. The real show-stopper belowdecks is the galley, which is split and runs athwartships just aft of the master cabin. To port is an Eno stove and Isotherm reefer, a built-in spice rack, drop-out cutlery bins and a built-in coffee maker that swings out to reveal tiny cubbies designed to hold prepackage tubs of coffee flavorings. To starboard are twin sinks and lots of countertop space. The great thing about this galley is that multiple people can assist in meal preparation without getting in each other’s way. If nothing else, I also like this lateral galley concept for its out-of-the-box thinking. The only real down side I can see is that you will have a long way to go when delivering a bowl of hot soup to the cockpit crew underway. 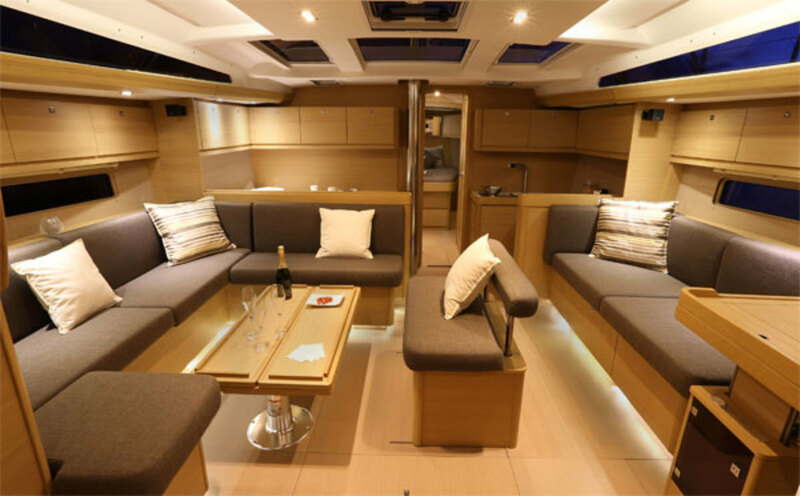 The saloon is enormous, with a U-shaped settee and convertible table to port and a straight settee to starboard at the end of which is a dedicated nav station that slides on rails and can face either forward or aft. Both the desk and the seat are hinged to provide a comfortable workstation when heeling on either tack. Two guest cabins, each with a head/shower, round out the aft end of the boat. The interior finish is Maobi veneer and solid wood. Headroom is generous throughout, maxing out at 6ft 7in in the saloon. The walk-through at the dock was intriguing, but would she sail well? Indeed she does—with an abundance of panache, in fact. Although the GL500 is massive, it doesn’t feel that way underway. On the contrary, the boat was fairly nimble and easy on the helm, even in the very light winds we experienced during our test sail. In 8-knot gusts, we were able to push up to 6.1 knots of boat speed at a 60-degree apparent wind angle. At 45 degrees we made 5.8 knots. We were easily the largest boat sailing that day and, surprisingly, had the least trouble moving in the sputtering breeze. Auxiliary power is provided by a 75hp Volvo Penta diesel, which can be upgraded to 110hp, and a saildrive leg. A three-blade fixed propeller is standard. In flat water with little breeze, we motored back to our slip at 8.7 knots with the standard engine. Tankage is excellent, as it should be on a luxury yacht of this size, with 190 gallons of water in three tanks and 132 gallons of fuel in two tanks.